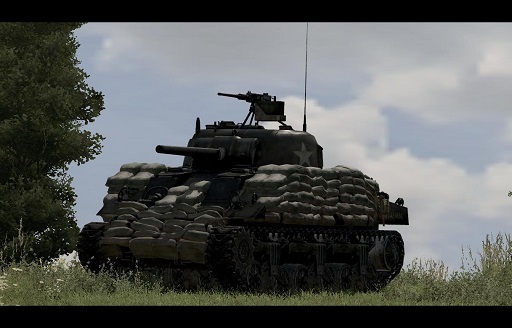 Sandbagged Sherman Script - Welcome to the Iron Front Fan Forums! This script adds awesomeness to the IF M4 Shermans. It also adds, obviously, a Browning .50 caliber to the turret. Manning the .50 looks natural so no skeptics. Two backpacks to the rear of the hull were also added. Containing ammo for both the BAR and Bazooka and can be removed. The script can be called by as many Shermans as you'd like. For the Standalone IF users. Just remove the two lines that add the .50 caliber in the script. I recommend using titleText ["", "BLACK IN", 1] or so for intros to hide the bag placing. The M2 machinegun stays hovering after turret blows off. OuedMeliz01, Not exactly. I had this for a long time now. Just not in script form. What you did was nudged me to script it and release it. Santa, have you given any thought on to adding anything more, such as logs, concrete, etc to one of these tanks? Here's a video with some pretty interesting information. My father is a WWII vet and he basically said the same thing the gentleman in this video said. My family kept me out of the military since all of them had war experience, Dad WWII, brother Korea, two brothers Vietnam. They did everything they could to keep me out especially my Dad. I thought he was going to kill the recruiter I set up a meeting with at our library, how he found out I just don't know. Anyways here's the video. Very nice. Thank you. Are you planning to release this as an addon in the near future? Not doable using my methods Gerhart. The only logs available are 20ft long. Trust me. I thought of every object in editor for the tank with respects to authenticity. The last part of the video. My memory is a bit fuzzy so don't quote me. It took place a week before the German surrender. Hey Santa Six does the sandbags add any extra armor to a Sherman or is it more of a decorative/immersion additional feature? It's just for eyecandy. I didn't mess with any damage values. I don't think they even did anything in real life. Just a ease of mind, like helmets in a way. Yes please. Someone fix it. I still have no idea how to make multiplayer scripts. Too many isServer variations. It spawns sand bags and attaches to all tanks calling the script. In waiting that the problem will be resolved : if you use "simple" sandbags with the commands attachTo [_tnk,[0,2.6,0.5]]; ? You place all the necessary sandbags on the map, with the appropriate line of the script, in each of the sandbags ? I think I see what your getting at Joarius, Is this a sort of work around. placing the sandbags used by the tank in the mission then calling them with the script ? can you make that work Santa ?